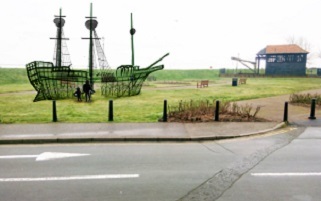 A piece of living art depicting The Mayflower ship is to be installed in Harwich later this year. The willow sculpture will be planted in Harwich Green as a permanent commemoration to the historic ship whose master, Captain Christopher Jones, lived in the town. In 1620 The Mayflower set sail to for America, and it is the vessel community’s first harvest which is celebrated by Thanksgiving each year in the USA. To mark the 400th anniversary of the historic trans-Atlantic crossing a whole series of events and celebrations are being planned both in Harwich, and at other Mayflower destinations, throughout 2020. The willow sculpture will be created in Spring as part of the Mayflower Trail, which will be installed around Historic Harwich later this year. It will be made by Willow Phoenix, a firm which has been working with Harwich schoolchildren on the Illuminate Festival. Installation will take place this spring, and it is hoped the community will also be involved in creating the artwork. Members of the community will also be trained up to help maintain the sculpture in the long-term. Mick Skeels, Tendring District Council Cabinet Member for Leisure and Tourism, said the sculpture would really capture people’s imagination. “Harwich Green is such a wonderful community space in the town, and this willow artwork will really stand out for both residents and visitors to enjoy,” Councillor Skeels said. Adam Lawes, from Willow Phoenix, said the firm was thrilled to be involved with the living willow Mayflower project. “Having worked with local school children and the Harwich Festival team for the last two years on the Illuminate parade, we are looking forward to working with the wider community on the Mayflower,” he said.